My Daughter-In-Law just asked me why I don’t have Wrinkles at 68 years old? I told her because I use SilkSkin. My skin is felling wonderful after one use of the 3 Minute Skin Care system. I am so happy with it. I am 71 years old and no one believes it. People think I’m in my late 50’s. I don’t have a wrinkle on my face, around my eyes or mouth. I believe it’s because of using the SilkSkin Three Minute Skincare products. I have been a customer for thirty years and have always order the Three Minute Skincare Kit. The products are the best for my skin and nothing else compares to it. The value for price is fantastic when someone realizes the benefits. I love the SilkSkin kit and the Lift Complex. I don’t have a wrinkle on my face and I am 58 years old. No one cane believe it and SilkSkin is the reason. I’ve used the SilkSkin kit since 1987 and LOVE IT! There’s nothing that compares to the SilkSkin Three Minute Skincare System. The SilkSkin kit is the greatest. The Toner is the best ever. 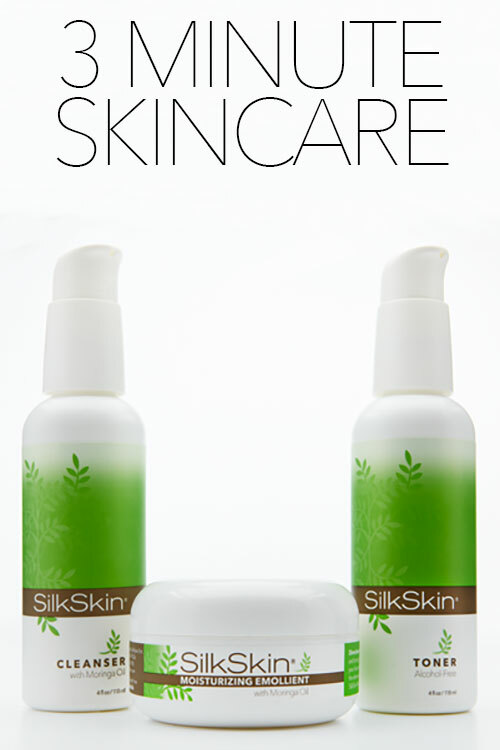 The SilkSkin kit contain the best products I have used for my face ever. I receive compliments on how lovely my skin looks everywhere I go. I love them! The SilkSkin Kit is the absolute best! I have never found better products than the SilkSkin kit! Every time someone asks me my age, which happens quite often, I tell them they can’t believe my answer because I look so many years younger than my actual age and I owe all that to the SilkSkin products. I have never been disappointed with the SilkSkin kit or any of the SilkSkin products. People say I don’t look my age and I owe it to SilkSkin.